If there is one thing Duxford can do well, it is World War 2 displays, being home to the one of the biggest collections of airworthy types from the conflict. So it would have been fairly easy for them to host a D-Day anniversary show without inviting anyone from outside the Airfield. But this year they really pulled out all the stops and managed to get no fewer than 5 C-47 Skytrains, including three survivors of the invasion. 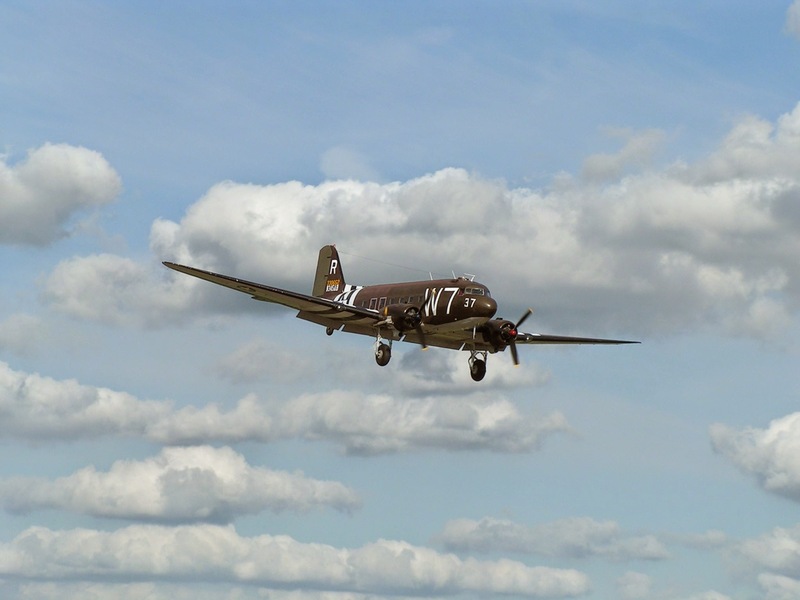 There were 3 examples from the UK and, more impressively, they managed to secure two C-47s visiting from the United States, which were on their way to the celebrations at Normandy in June. The two aircraft from America flew across the Atlantic in the weeks leading up to the show. The “Union Jack Dak” from Tradewind Aviation in Connecticut, was the first to arrive in the country, spending some time at Coventry prior to flying down to Duxford. This very aircraft was one of the 3 at Duxford that actually took part in D-Day. 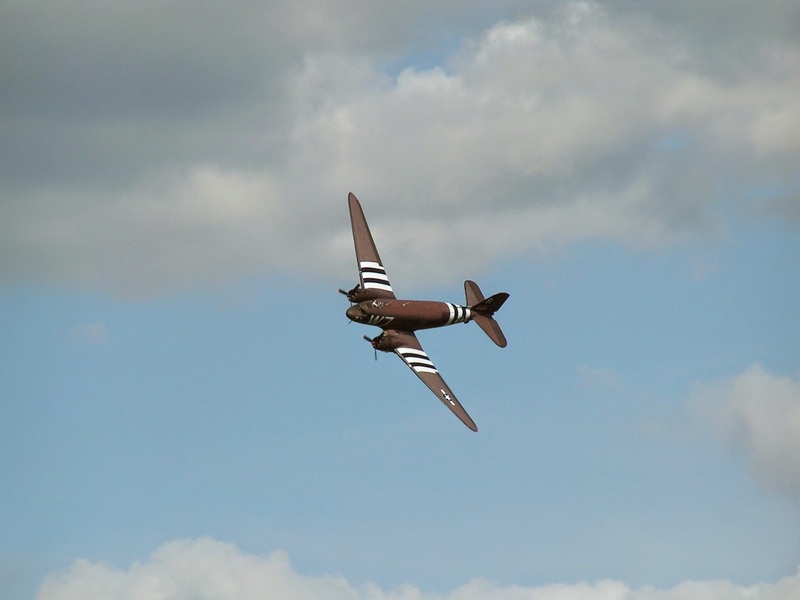 The second aircraft was another genuine D-Day veteran. Named “Whiskey 7,” it came into Duxford on the Friday before the show from Scotland, having spent the previous few days crossing the Atlantic from its National Warplane Museum base in New York State. The UK based examples were East Kirkby’s “Drag ‘em oot”, the third D-Day veteran, Aces High’s example from Dunsfold and the Battle Of Britain Memorial Flight’s (BBMF) Dakota III, which was resplendent in a special D-Day scheme applied for the season, depicting a 233 Squadron RAF aircraft, dubbed “Kwicherbichen” by its crew. These five aircraft were an impressive sight sitting out on the Duxford flight line together, with it being very rare to see more than one or two C-47s at a UK show. 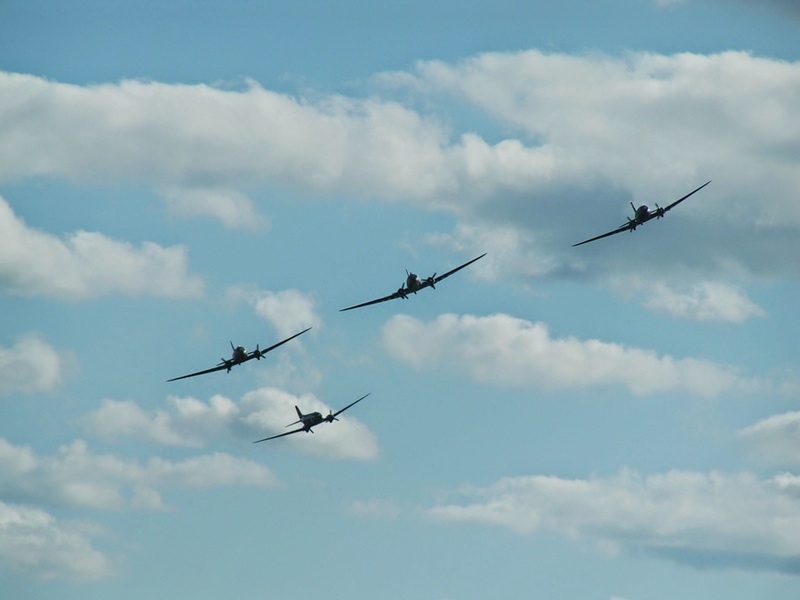 With the BBMF example displaying separately at the show, the other four aircraft made up the finale of the display. 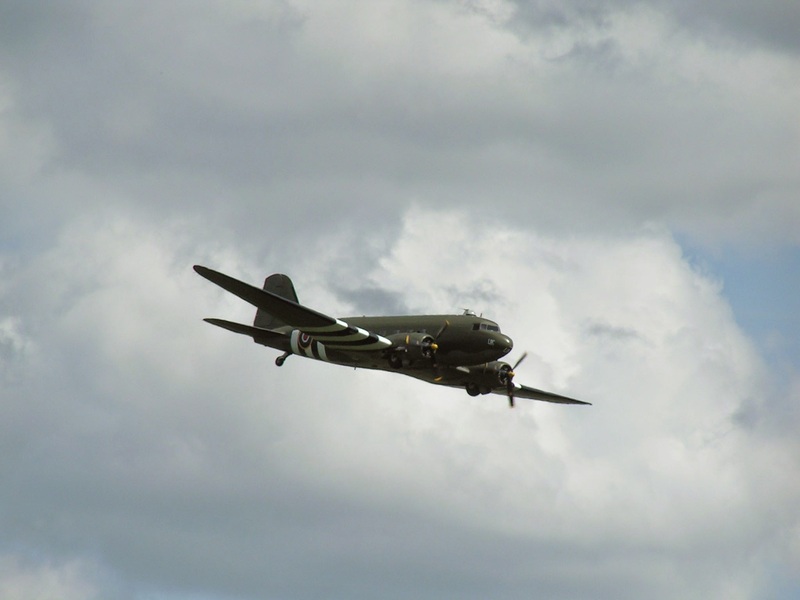 This segment commenced with the impressive sight of 4 invasion striped C-47s taking off from Duxford, 3 of which using the grass runway. This spectacle, of course would have been nothing compared the hundreds of Dakotas departing in the early hours of the 6th of June 1944. “Whiskey 7” performing a solo display. A low level solo routine from Whisky 7 started the display, while the other aircraft climbed to height and formed into Vic formation. 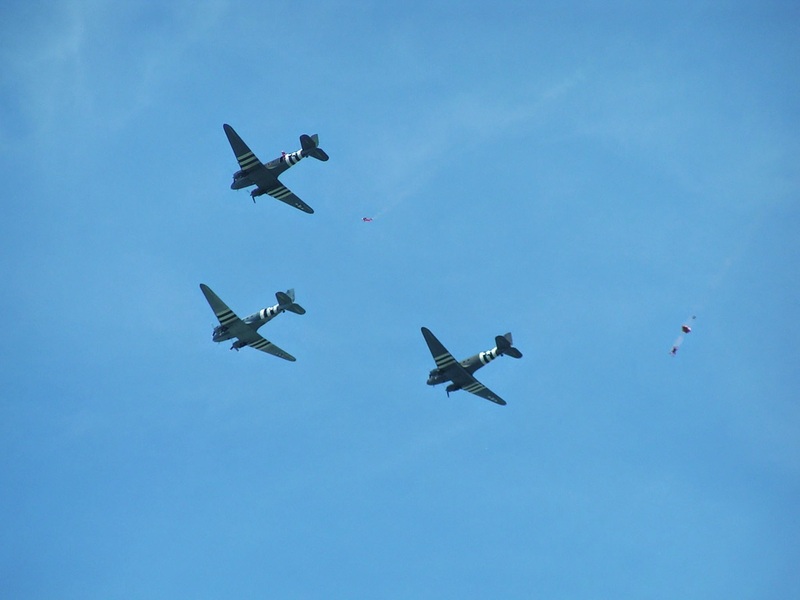 The 3 aircraft flew high above Duxford as the Red Devils parachute team jumped from the “Union Jack Dak”, providing a fitting tribute to the thousands of men who did just that over France 70 years ago. One of the Red Devils team jumping from the Tradewind Dakota. Following this symbolic drop, the formation moved down to lower level for a series of passes, with Whiskey 7 closing in behind, providing a loose box formation. Once the display was complete the formation split into sections, with “Whiskey 7” coming in to land first. Then “Drag ‘em oot” and the Tradewind machine completed an impressive pairs landing on the grass, while the Aces High aircraft landed on the hard runway, bringing an impressive tribute to a close. “Whiskey 7” in the foreground, with “Drag ’em oot” and the “Union Jack Dak” in behind. 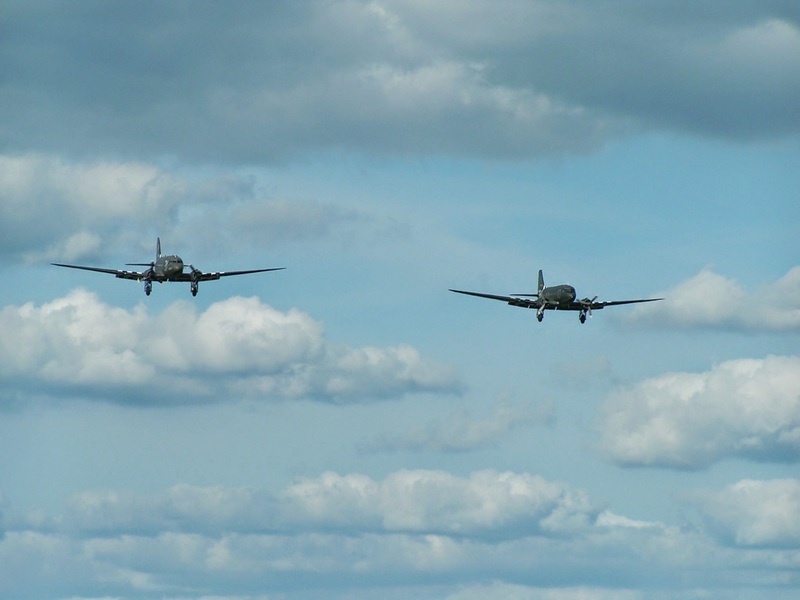 “Union Jack Dak”, left, and “Drag ’em oot”, right, come in for a formation landing. This display, combined with the “glider assault” tribute that opened up the show made for one of the best D-Day tribute air displays I can remember, and certainly a highlight of the year. 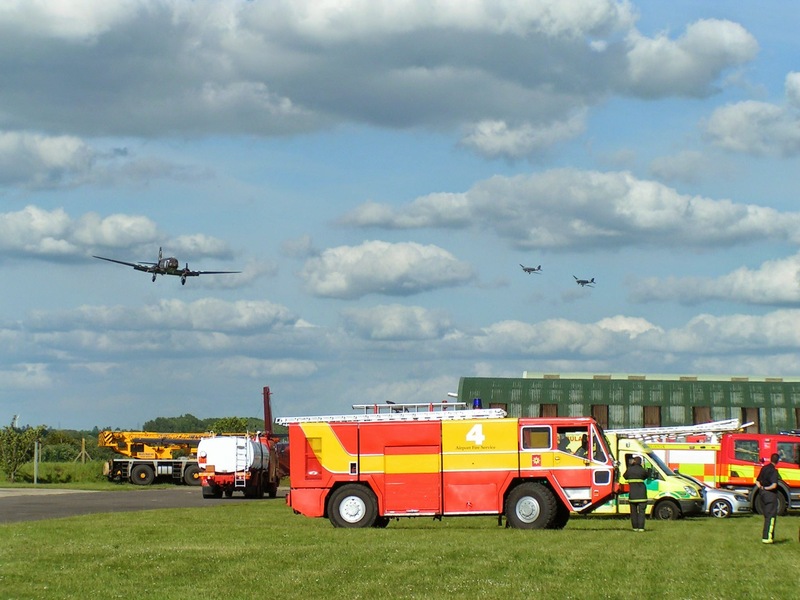 Well done to IWM Duxford for securing these aircraft. Don’t forget to follow @warbirdtails on Twitter and like us on Facebook at http://www.facebook.com/warbirdtails for more Airshow Moments and other updates.